Formula One F1 - Malaysia Grand Prix - Sepang, Malaysia - October 1, 2017. Redbull's Max Verstappen celebrates winning the race with teammate Daniel Ricciardo. SUZUKA, Japan - Red Bull drivers Daniel Ricciardo and Max Verstappen pinned their Japanese Grand Prix hopes on strategy and a quick getaway on Saturday after losing out to champions Mercedes and Ferrari in qualifying. Australian Ricciardo was fourth fastest ahead of 20-year-old Verstappen but the duo will start third and fourth due to the Mercedes of Valtteri Bottas dropping five places for an unscheduled gearbox change. Championship leader Lewis Hamilton was on pole for Mercedes with Ferrari’s Sebastian Vettel, 34 points behind the Briton with five races remaining, second on the grid. “I think the start will dictate a lot,” Ricciardo told reporters. Verstappen, the winner in Malaysia last weekend who was also about a second off Hamilton’s pace at Suzuka, said Red Bull were just not as strong this time. “I think more corners are flat-out this year and a lot faster so it becomes more of a straight, so it’s a bit more painful for us,” said the 20-year-old Dutch driver. Both drivers had sounded a very different tone last weekend, and also in Singapore where they showed pace capable of matching the two teams ahead of them. The talk heading into the Japanese Grand Prix was of a three-way fight for race wins, with Red Bull potentially acting as kingmakers in the Hamilton versus Vettel title fight. The team’s motorsport consultant Helmut Marko even said the outfit now had the best chassis on the grid. 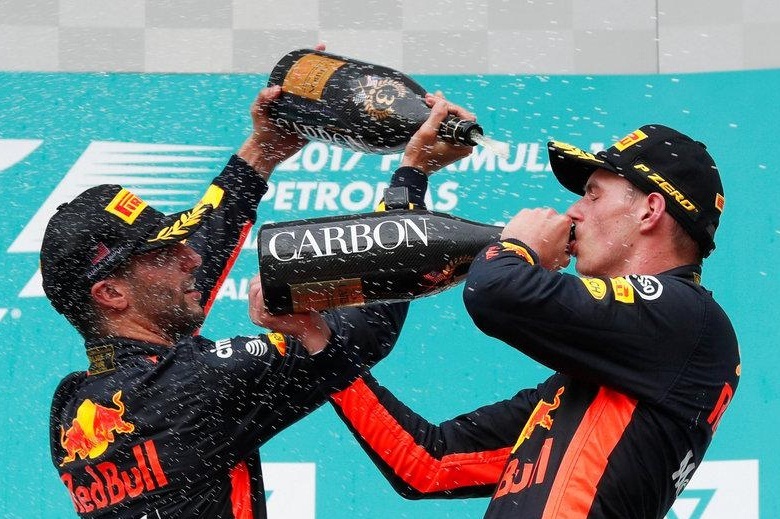 ”We definitely felt like ours worked better in Malaysia” said Ricciardo, who scored the team’s first win this year in Azerbaijan in June. Red Bull drivers Daniel Ricciardo and Max Verstappen pinned their Japanese Grand Prix hopes on strategy and a quick getaway on Saturday after losing out to champions Mercedes and Ferrari in qualifying.